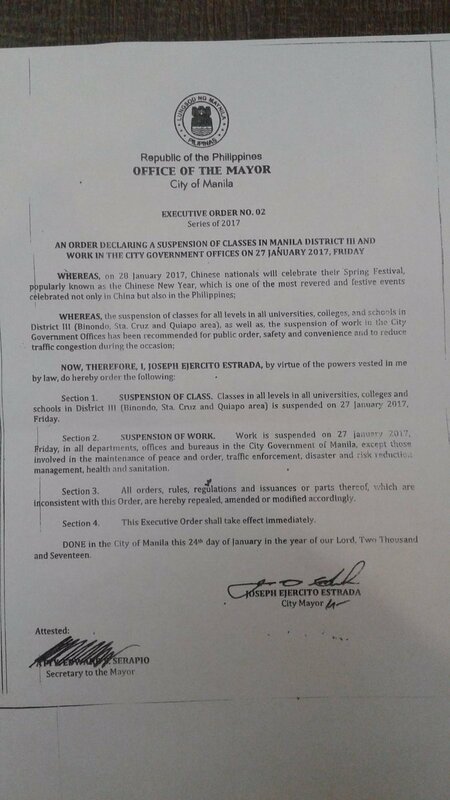 The suspension of classes for all levels in all universities, colleges and schools in District 3 (Binondo, Santa Cruz and Quiapo area) as well as the suspension of work in the City Government offices has been recommended for public order, safety and convenience and to reduce traffic congestion during the occasion. The resolution likewise stated that work will be suspended on Friday in all departments, offices, and bureaus in the City government of Manila, except for those involved in the maintenance of peace and order, traffic enforcement, disaster and risk reduction management and health and sanitation. Here is the full text of the resolution courtesy of DZMM.